With more than 230 parks throughout Vancouver, there is no shortage of outdoor recreation in the city. 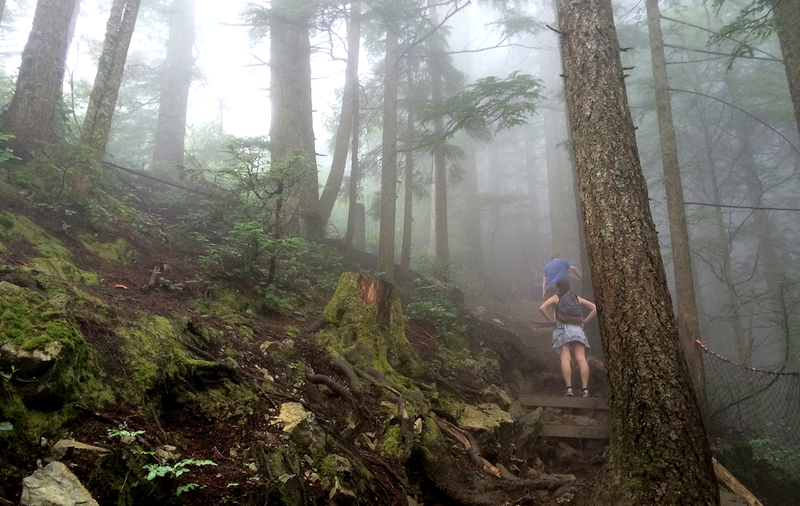 For an extra challenge, we headed north to Grouse Mountain to hike the Grind. Often called “Mother Nature’s Stairmaster”, this trail is under 2 miles long but is a straight shot up the mountain with an elevation gain of 2,800 feet. The Grouse Grind reminded me a little of the Incline in Colorado (shorter distance at a higher elevation), and was quite possibly one of the most beautiful places I’ve ever hiked. If you’re staying in Downtown Vancouver, it’s super easy to get to the Grouse Grind using public transportation. From the Waterfront Station, purchase a Zone 2 ticket and hop on the SeaBus passenger ferry to get to the Lonsdale Quay Station in North Vancouver. The ferry departs every 15 minutes and the journey takes only 12 minutes. From here, you’ll connect with bus #236 (located in Bay 8 of the terminal) to get to the base of grouse Mountain. It’s the last stop on the line so you won’t have to worry about missing it. Total travel time including the ferry ride is about 40 minutes. Note that this bus also stops at the entrance of the Capilano Suspension Bridge Park if you are interested in going there, and most drivers will announce the stop so you know when to get off. When you’re ready to return to Downtown, the same bus will take you back to the ferry terminal. 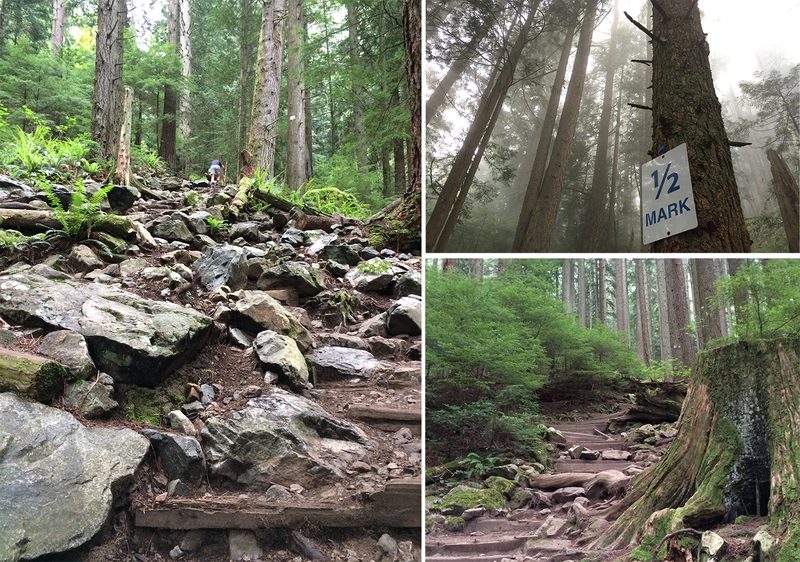 You definitely want to wear good shoes to hike the Grouse Grind since the terrain is very uneven and the rocks may be slippery. Lightweight, quick drying layers are also a good idea. Shortly into the trail, you’ll notice that the “stairs” vary from wood to stone and sometime even tree roots and become increasingly steeper. I was amazed by how beautiful and dense the forest was. As you climb higher, the light begins to disappear and the air becomes more damp and foggy. The trail is so green and lush, like something out of a Lord of the Rings movie, that you forget about being out of breath because your surroundings are literally that breathtaking. Victory! We reached the top in about 1 hour and 20 minutes with a handful of short breaks to take photos. Our clothes were a little wet but dried rather quickly inside the chalet, where you’ll find restrooms, a coffee bar and a restaurant to refuel. Looking back, the trail was a good length, but I enjoyed the challenge and payoff so much that I almost wish it was longer. 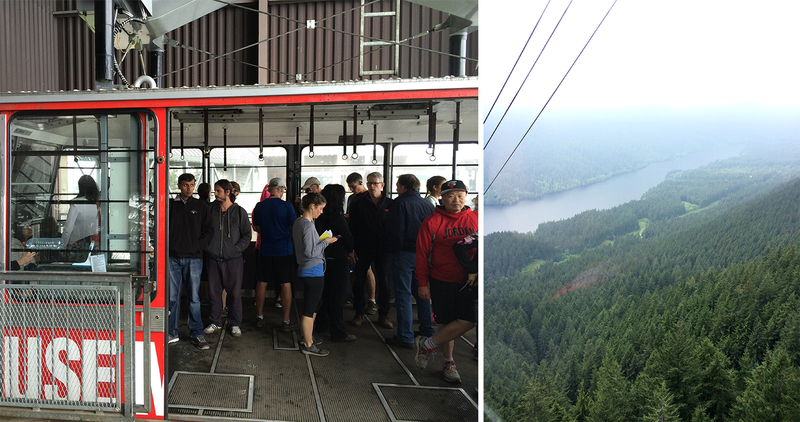 Unfortunately, the Grouse Grind is too steep to hike down, so you have to buy a ticket for the Skyride aerial tram, which will breezily take you to the bottom of the mountain in a mere 8 minutes. Hiking the Grouse Grind was an amazing and worthwhile experience that I would definitely tackle again. For more information visit www.grousemountain.com/grousegrind.